Orchids and Onions: The angels have the phone box. 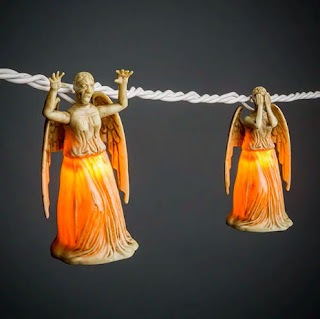 If I were to have a Christmas tree, then it would be adorned with these Weeping Angel fairy lights. I've been a huge fan of the Dr. Who reboot. The ep. called Blink is one of the best & most disturbing. Blink really plays like a small, independent film--kinda like a Black Mirror episode. The acting is lovely; the story is, ultimately, uplifting. The main characters of Dr. Who take a backseat in this episode. We really only see David Tennant & Freema Agyeman a handful of times during Blink & they are not missed, to be honest. A young Carey Mulligan has a lovely turn as the main character, Sally Sparrow. If you're at all keen on time travel, love lost and found, and terrifying 'angels', then check Blink out. Ah, "Blink". I finally got my mother to watch an episode of Doctor Who. Finally. She wouldn't until then. And this was the episode that was on. (First run.) Freaked her out so bad she refused to watch another. Sigh. That was the best episode, wasn't it? Sorry your mom got so freaked out. Could you blame her?! Visiting a cemetery never felt the same again after Blink. I love those angels. I want a set.